Retired teacher and blogger Hilda Smith (Over The Hilda) remembers her first Christmas at her in-laws and how it helped teach her what she wanted from festive celebrations to come. I fancied him from the beginning but he was going out with somebody. He said he fancied me in the beginning but he was also going out with somebody! Both of our relationships broke up in December and we started going out in Galway on the 14th February. That was our first kiss, if you like. He asked me out then and that was it. We were engaged a year later and married four months after that. I’m the eldest of six girls. Christmas in our house would always have been chaotic, but fun. My mother fed half the neighbourhood – people across the road, aunts, uncles. It was always a bit frantic, but lots of fun. That first Christmas was lovely. It was a very nice day. But it wasn’t the type of Christmas I was used to. It was quiet. There was only four of us. My mother-in-law had no interest in food. It was always about how the table was set. We had to listen to The Queen’s Speech. That was part of the day. It was about sitting down with the knives and forks. It was very formal in many ways. Every year for the first three years, we ate there. Then we had children and I said, ‘We’re not doing this anymore.’ Graham said, ‘Do you mind cooking? They’ll have to come to us.’ She was actually quite happy to because she didn’t like cooking anyway. The first thing she did when she came in was come in and look at the table. She was always very nice like, ‘Oh the table is beautiful, I have to take a photograph of the table.’ She’d like things done a certain way – she’d have been mortified or really cross if I didn’t have napkins on the table! My first Christmas was not the type of Christmas that I necessarily wanted or that I continued. It wasn’t the same. Everything was all to do with the table looking lovely and it didn’t really matter what kind of food was on it. I wanted a Christmas that was more fun. We came from a house where you’d pull crackers and play games and that’s the type of Christmas we have reinstated, Graham and I. We have always played games on Christmas evening with the girls and anyone else who comes for dinner. When my parents-in-law came to our house, the funny thing is that they did loosen up a bit. We did play charades – okay, my father-in-law might have fallen asleep during it – but they did loosen up. The message is there’s compromising and there’s doing what is right for your family. That’s important, too. You must put your family first. Happy children, happy husband, happy house – that’s it, isn’t it? This Christmas, the family are coming here – our two daughters, their men, and our grandson. It will be brilliant. Want to win a festive food and wine hamper worth €100? Enter this week’s Aldi Christmas Magazine competition right here. Email “'I fancied him from the beginning': Our first Christmas as a married couple, 36 years ago”. 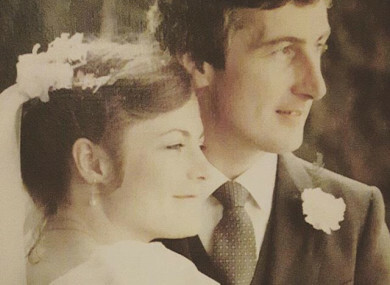 Feedback on “'I fancied him from the beginning': Our first Christmas as a married couple, 36 years ago”.